This week's pearl is dedicated to all of you gamers out there (and we're not talking Xbox-ers), wherever you may be. Yes, even at play, lighting can make or break the experience. Here we're informed that one strong light source is not ideal, "for your eyes glance about." Oh, and I feel obligated to point out: the ladies are winning. How perfectly marvelous! 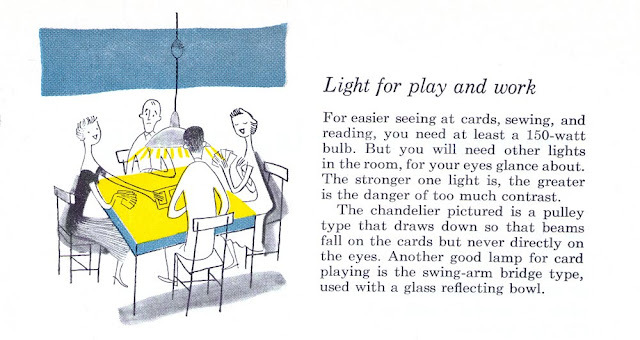 "For easier seeing at cards, sewing, and reading, you need at least a 150-watt bulb. But you will need other lights in the room, for your eyes glance about. The stronger one light is, the greater is the danger of too much contrast. The chandelier pictured is a pulley type that draws down so that beams fall on the cards but never directly on the eyes. Another good lamp for card playing is the swing-arm bridge type, used with a glass reflecting bowl."